Posted by sneaks in display topics, summer, Summer Reading Club 2007. Click on this picture and check out the details – this is Parkville’s SRC display, and isn’t it great? Sneaks is on a road trip from California to Baltimore. His progress marks Parkville’s progress meeting their SRC signup goal! The postcards around the edges are from SRC participants who took library address labels with them on vacation and mailed back a card. Many thanks to Margaret MacLeod for sharing this fantastic display! Posted by sneaks in display topics, Summer Reading Club 2007. The new movie entitled The Golden Door, reviewed in the Baltimore Sun, is about European immigrants coming to the United States by ship. The title is taken from The New Colossus, the Emma Lazarus poem inscribed at the base of the Statue of Liberty. If you think about it, you can relate the immigrant journey to a Reading Road Trip, and maybe get some Summer Reading Club mileage out of the movie (pun intended). Or you might fill out an adult display with a combination of books about Ellis Island, both fiction and nonfiction, and books from both sides of the current immigration debate. Hmmm! This wonderful article from the Christian Science Monitor underlines the importance of libraries for people who are new to this country, seeking language and assimilation skills. Posted by sneaks in great ideas, summer, Summer Reading Club 2007. Thanks to Dave Lapenotiere of White Marsh for sending this picture of their SRC display table covered with maps. It’s an inspired display idea that’s also inexpensive and quick – what’s not to love?! You might also use road maps as backdrops on standing shelf units. 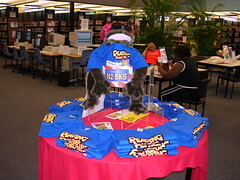 Posted by sneaks in BCPL best practices, display topics, Summer Reading Club 2007. Quoted from each branch manager’s monthly reports, here’s how our libraries are looking for Summer Reading Club! Essex: As you enter the library you see the lighted arch with small cars traveling in rows. Dangling from the center of the arch is a working traffic light and on the SRC table a ‘smiling car’ tablecloth. The ceiling is arrayed with numerous hanging vehicles and the window is painted with a colorful three panel window of Sneaks and friends. The Essex Staff is serious about Summer Reading Club decorating. Hereford: Doris Somers and Jeanne Andrews have taken the lead with SRC planning and decorating, with beautiful results. Our customers can come to HE and look around to see an adventurous Sneaks driving to DC, New York, the beach, and other great destinations. Landsdowne: While Lorrie Jackson was working on finishing her SRC painting in our gorgeous area way, she looked through the window and saw a different kind of moon in the form of a naked derriere belonging to a young patron unhappy at being asked to leave for the day. Parkville: Spotted through the window with a sleeping kid in the back of the Subaru: a cool signpost noting direction and mileage to several exciting destinations that you can visit virtually in books! Reisterstown: Put your seatbelts on – Sneaks is on the move. The library has been transformed into a travelogue by our excellent SRC team. What a wonderful team! For example, the lobby is the West Coast complete with waves, sun, vineyard, and a “bathing beauty” sunning herself on the top of the hold shelf. White Marsh: Our information desk is decorated in a cool road sign cloth Mary Power picked up at a crafts store. 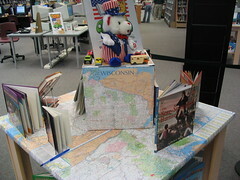 Table displays are covered with maps. If you’ve got photos or additional inspiration and description, please send them to pwilley@bcpl.net. Thanks! Posted by sneaks in display topics, J fiction, J is for Juvenile, J non-fiction, nonfiction, summer, Summer Reading Club 2007, YA. We know you’ll be recommending the classic journeys of children’s literature during SRC this summer: Huckleberry Finn, Hitty, Walk Two Moons… but what about those kids who insist on “true books,” the kids who want non-fiction or at the very least historical fiction? 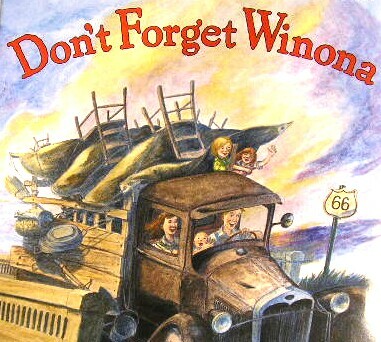 Look to America’s famous trails and roads for fascinating true stories and historical fiction. 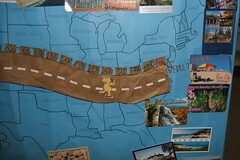 The Oregon Trail, the Lewis and Clark Expedition, and the Underground Railroad are just three examples of American journeys that have provided vivid settings for terrific works of children’s literature. You might use the themes listed below to create informative displays, flesh out your book lists, or to inspire your efforts to find just the right book for your nonfiction and historical fiction readers. Click “more” for a list of journeys and trails in American history. A few notable recent books are highlighted for each (Easy, Juvenile, and adult titles suitable for teens are listed). Call numbers are provided.